Ok this probably needs a catchier name but it really is what it says on the tin. I am a huge fan of Christmas cake, Christmas pudding and of course custard. I love the festive fruity flavours even if they are a little heavy for a New Zealand Christmas. If you’re in need of a change up from regular hot steamed pudding on the big day or you just have some dry Christmas cake or steamed pudding sitting around that needs a home then this is the recipe for you. This uses my brown sugar ice cream base to give it that lovely custardy flavour. I swear it is like eating cold pudding and custard and I couldn’t be more chuffed with myself. My Christmas cake tradition involves giving two halves of my large cake away to both of our parents leaving none for myself but I knew I wanted to make this delight so I was a little sneaky and siphoned off some of the batter into a small round tin and make a separate tiny cake to make this with. If you aren’t so forward thinking or just don’t want to make a cake full stop you can either scrounge your Nana’s pantry or just buy an un-iced one from the supermarket. You can also use whichever spirit you have lying around. I used bourbon for this after Dylan banned me from touching his good whisky. Port, brandy or cognac would do the trick too. Start by whisking together the eggs, sugar and the vanilla either with a stand mixer or an electric hand beater. While this is going on heat the milk and cream in a large sauce pan until it is almost too hot to dip your finger in. With the mixer still slowly mixing the egg and sugar, gently and gradually start pouring in the milk and cream. Keeping the mixer running whilst you pour the milk into the egg helps to distribute the heat and prevent the egg from scrambling. Once all the milk has been mixed into the egg and sugar and it is a nice homogenous liquid return the custard to the large saucepan. Heat the custard over a gentle heat, stirring with a rubber spatula until it either thickens ever so slightly or reaches not a degree over 80 Celsius. If your custard starts to simmer the egg will curdle and you'll have to start again so be really gentle in your heating. Once at the right temperature remove the custard from the heat, whisk it for a few minutes to help cool it down and leave it to get to room temperature before chilling in the fridge overnight. Don't forget to pop your ice cream maker bowl in the freezer at this time too. The next day assemble your ice cream maker. Pour in the cold custard and switch the churner on. I often put a plate over the top of mine to stop the hot air get in especially if it is a hot day. 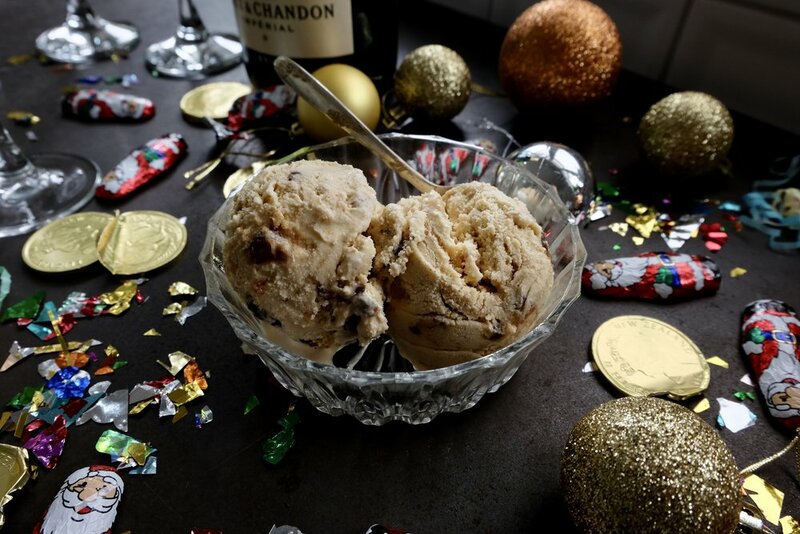 While it is churning drizzle your choice of spirit over the crumbled Christmas cake and leave to soak in the freezer. Churn for about 20 minutes or until a stiff soft serve forms. At this point tip in the Christmas cake and let the churner stir it through. Once evenly mixed transfer to a pre chilled container and whack in the freezer as soon as possible. Leave to harden for at least six hours before devouring.